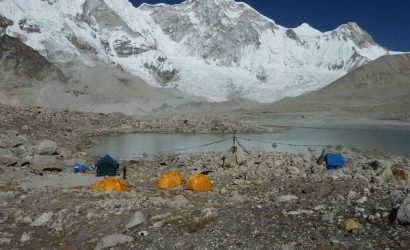 The Langtang Ganja La Pass trek is one of the challenging high passes trek in Nepal because of its wilderness and unfavourable weather conditions. 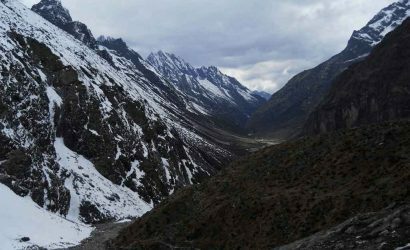 The Ganja La Pass (5,130m/16,831ft) trek follows the Langtang River through the popular Tamang settlement to the east until we reach Kyanjing Valley. 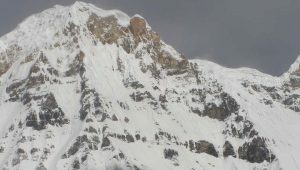 This trek requires some good equipment and knowledge of mountaineering skill. Kyanjing Valley is formed by Mt. Langtang Lirung (7,246m/23,774ft) on the west, Yala Peak (5,732m/18,806ft) on the north, Dorje Lakpa (6,989m/22,931ft), Urkeinmang (6,387m/20,955ft), Loenpo Gang (6,979m/22,898ft) and Kangchenpo on the northeast. The spectacular view of Langtang Lirung on the Ganja La Pass crossing is the major attraction of this trek. This challenging trek is possible to accomplish for some selected months only. After crossing the Ganja La Pass, the trail connects us to Tarkeghyang in the Helambu village. We meet Sherpa people here but they are different from the Sherpas in Solukhumbu. The Helambu village offers a wide range of mixed cultures of Sherpa, Tamang and Lama Societies. This area is also famous for apple production and beautiful landscape. Finally, the adventure ends at Melamchi Bazzar. 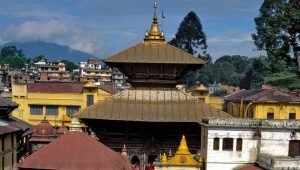 We take a scenic drive to Kathmandu. Drive from Kathmandu to Dhunche (2,030m/6,660ft). Today we drive for 118km (6-7 hours by Jeep and 8-9 hours by only local bus) from Kathmandu to Dhunche. We cross the ring road and along the Rani ban (forest), climb to Kakani from where we have good views of the Himalayas including Manaslu, Ganesh Himal and Langtang before we reach Rani Pauwa where most of the local buses stop for a tea break. We then travel down to Trisuli via a flat piece of land which is where we stop for lunch (local food e.g. daal-bhat) at Battar Bazaar (540m/1,771ft). After lunch we continue our journey climbing up to Dhunche via Kalikasthan. We also pass through the National Park check post before Dhunche. Trek Dhunche to Thulo Syabru Village (2,210m/7,251ft). We walk along the road to Thulo Bharkhu (1,860m/6,102ft) then a steep climb up to Brabal (2,190m/7,185ft) where we stop for lunch. After lunch we continue our trek through the beautiful countryside of oaks and pine trees to our overnight stop at Thulo Syabru village. Trekking time 5-6 hours. Trek Thulo Syabru Village to Lama Hotel (2,410m/7,907ft). After breakfast we descend down along the village and cross the bridge then climb the other side. We then descend down to the landslide and have a slow climb along the Langtang River all the way to the Lama Hotel where we have our overnight stay. Trekking time 5-6 hours. Trek Lama Hotel to Langtang Valley (3,330m/10,925ft). Today our trek takes us through oaks, hemlock and bamboo where if we are lucky we will see a variety of birds. We ascend along the Langtang Khola (River) passing Ghoratabela (2,992m/9,816ft) where we can see views of the Langtang Himal just above us. Langtang is a large village where people live all year round cultivating potatoes, buckwheat, barley and vegetables. There is a village monastery which can be visited at anytime as the headman has a key to the monastery. Trekking time 5-6 hours. 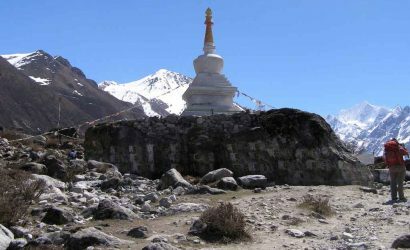 Trek Langtang Valley to Kyanjing Gompa (3,800m/12,467ft). This is a short beautiful alpine trek along the meadows which have grazing yaks, sheep and mountain goats. The village has the Yala Cheese Factory and an ancient monastery which can be visited at any time. Trekking time 2-3 hours. 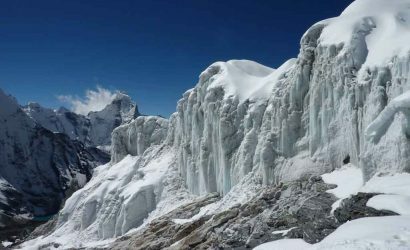 Exploration day at Kyanjin Gompa/Climb Kyanjing or Tserko Ri (5,033m/16,513ft). Today we have an excursion to see the glacier and climb Tserko Ri, this is comparatively a small, rocky peak while not being a mountain of any real prominence, it is conveniently easy to climb and from its summit magnificent views can be had. 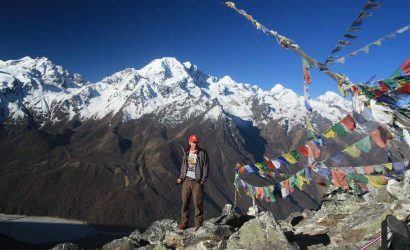 This is also an excellent lookout which can be reached by climbing the slopes immediately behind Kyanjin where we will see the majestic Langtang Lirung (7,246m/23,774ft) rising above the glaciers. A visit to the Yala Cheese Factory completes the day. Trek Kyanjing Gompa to Ganja la phedi (4,500m/14,764ft). Today we continue our trek on the off-track towards Ganja la pass. We cross the Langtang River and ascend through the rhododendron forests to reach the Ganja la phedi and camp overnight there. Phedi literally means the foot of the mountains. So, here we are at the foot of the Ganja la pass (5,130m/16,831ft). Trekking time 6-7 hours. Trek Ganja la phedi to Keldang (4,270m/14,009ft) crossing over Ganja la Pass (5,130m/16,831ft). Today we have a strenuous day as we have to cross the Ganja la pass. 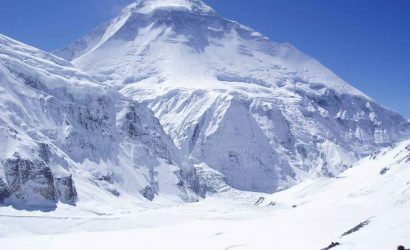 Ganja la pass is covered with snow almost throughout the year and it is one of the difficult passes in Nepal. We make a long ascent through the boulders, pass the small lakes and finally summit the Ganja la located on a rocky moraine. The views are spectacular from the pass. We then descend down to Keldang from the pass. We stay overnight at camp in Keldang. Trekking time 7-8 hours. Trek Keldang to Dhukpu (4,040m/13,255ft). From Keldang, we descend further down following a prominent ridge line and reach Dhukpu. As we descend down, we continue losing our altitude through forests, ridges and grasslands. We stay overnight at camp in Dhukpu. Trekking time 5-6 hours. Trek Dhukpu to Tarkeghyang (2,740m/8,989ft). We continue descending on the more similar trail but with more vegetation and finally reach Tarkeghyang. Tarkeghyang is the largest and picturesque village in the Helambu region. Trekkers enjoy at this beautiful village located on a shelf high above the river. 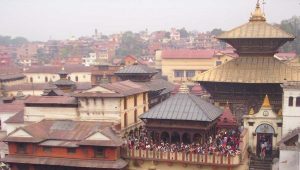 'Tarkeghyang' means "100 horses" & was taken from the name of a temple established in 1727 by a Lama (Buddhist monk) who was called on by the king of Kathmandu (Kantipur) to stop an epidemic. The Lama asked for 100 horses, which he brought here, as a reward. Trekking time 5-6 hours. Trek Tarkeghyang to Sermathang (2,590m/8,497ft). After having a memorable stay at the beautiful village of Tarkeghyang, we continue descending down from the edge of the ridge but then continue at around the same altitude along the side of the ridge crossing a number of streams and waterfalls and a landslide. Then we pass by a Gompa and reach the village of Sermathang for overnight rest. Trekking time 4-5 hours. Trek Sermathang to Melamchi Bazzar (870m/2,854ft) and drive back to Kathmandu. Today we follow the ridge all the way down to Melamchi and after passing a large Gompa at the southern edge of the village, we undulate along the west side of the ridge passing chortens one after another before dropping down to Kakani (1,996m/6,548ft). From Kakani we descend down to a small village of Duwachaur (1,500m/4,921ft). From here the trail continues to descend even more steeply down the ridge to the junction of the Indrawati and Melamchi Rivers. After crossing the suspension bridge over the Melamchi River, we will finally reach Melamchi Bazaar. Trekking time 3-4 hours. We then drive along the Helambu highway to Kathmandu. It takes about 2-3 hours to reach Kathmandu from Melamchi Bazaar.